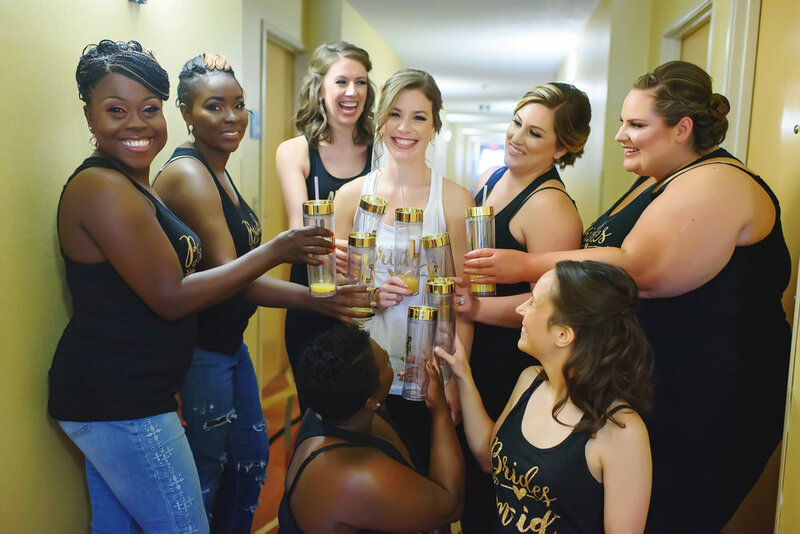 A black and gold wedding color palette provided the perfect modern flair to Alvin and Lindsay’s rural wedding at Whitetail Ridge Golf Club. With stunning photos captured by Katelyn Turner Photography, you’re not going to want to miss seeing all the details below! From the bride: The ceremony was at Chapel on the Green in Yorkville which is a church that was built in the 1800's and has been restored. The original organ was played and the church bells in the tower were rung. Alvin's brother-in-law said the service. We did a sand unity ceremony and said our own vows. I HIGHLY recommend writing your own vows! It was so much fun and probably my favorite part of the whole ceremony. We both loved it and are going to frame our vows. After the ceremony, the bridal party went down to the river and to our favorite outdoor bar (Southbank Original Barbecue aka: SOB's) for pictures and shots. It was a blast! From the bride: Finally, the reception was at Whitetail Ridge Golf Club in Yorkville. We had a black and gold themed wedding with the bridesmaids picking out their own gold sequins dresses. I highly recommend this venue as they include SO MUCH! The centerpieces were included, all of our table cloths and other linens, the backdrop and lighting behind the head table, flowers on the tables, etc. We had a candy table which was a huge hit! There was a photo booth and DJ provided by Monastero Entertainment. Wedding Invitations & Stationery: Invitations Etc.